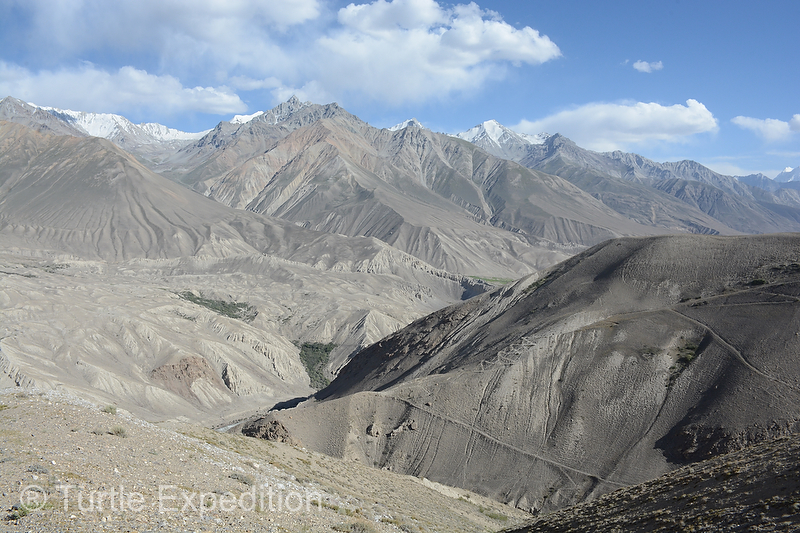 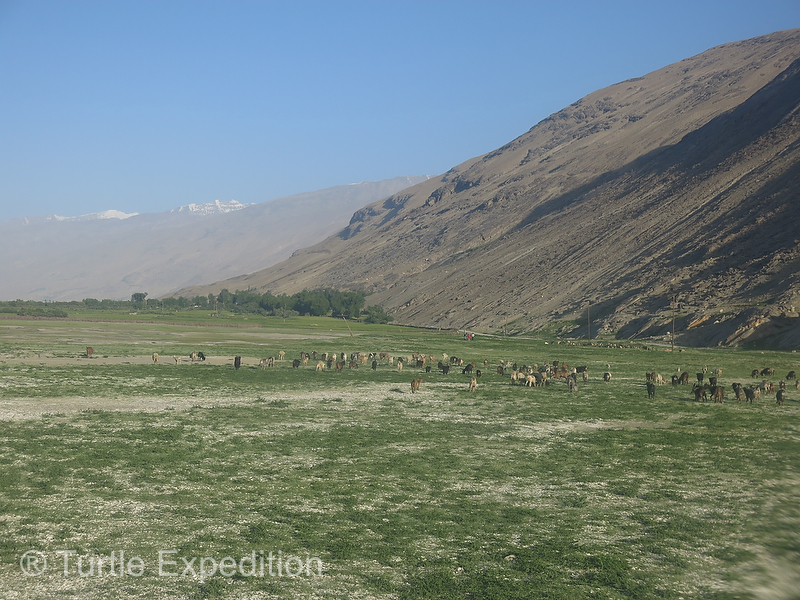 Ever since we began planning our adventure along the Silk Road, the Wakhan Corridor had been an intermediate goal. 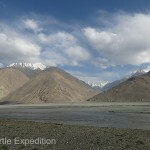 It was part of the route that Marco Polo took on his journey across Central Asia in the 13th century. 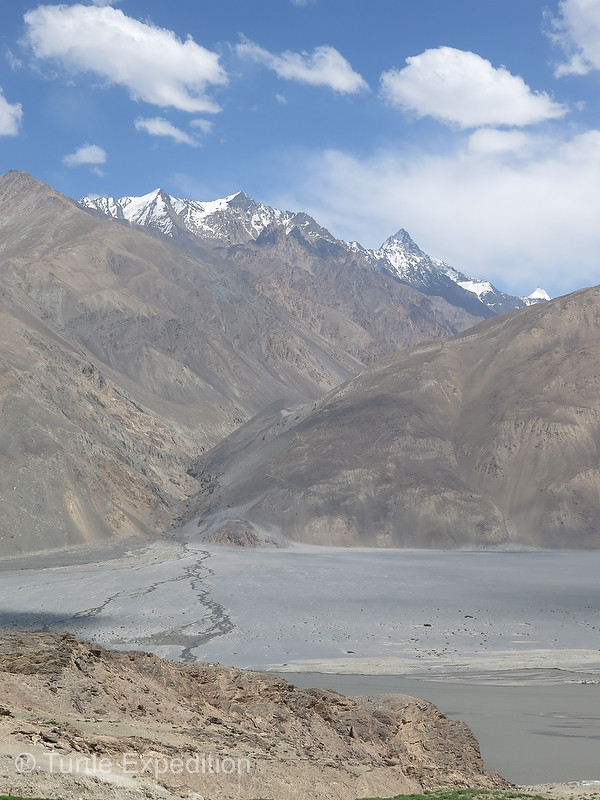 The Corridor itself was created during the Great Game era (1800’s) by the Russian and British who decided their empires should not have a joint border in order to avoid conflicts, so they created this buffer zone, an artificial finger sticking towards China. 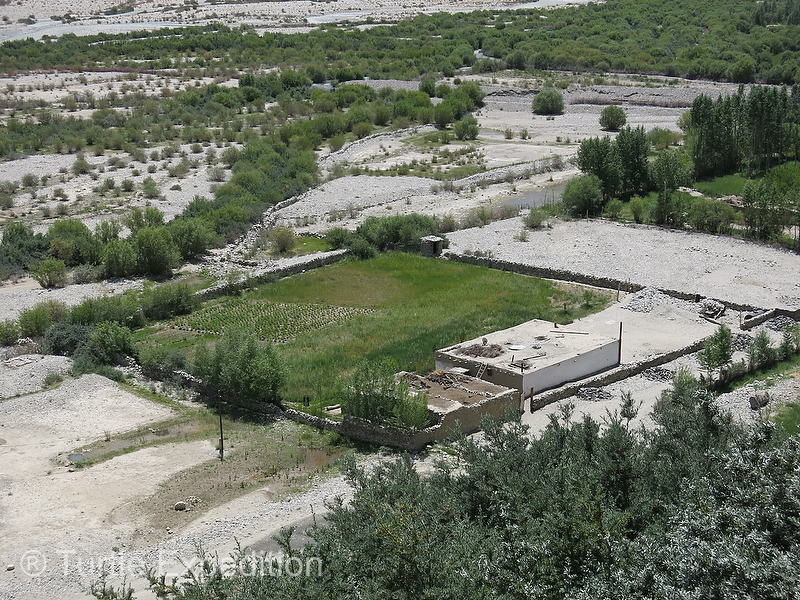 They gave it to Afghanistan that is quite unfortunate, as the local population is far removed from Kabul and gets little support or attention. 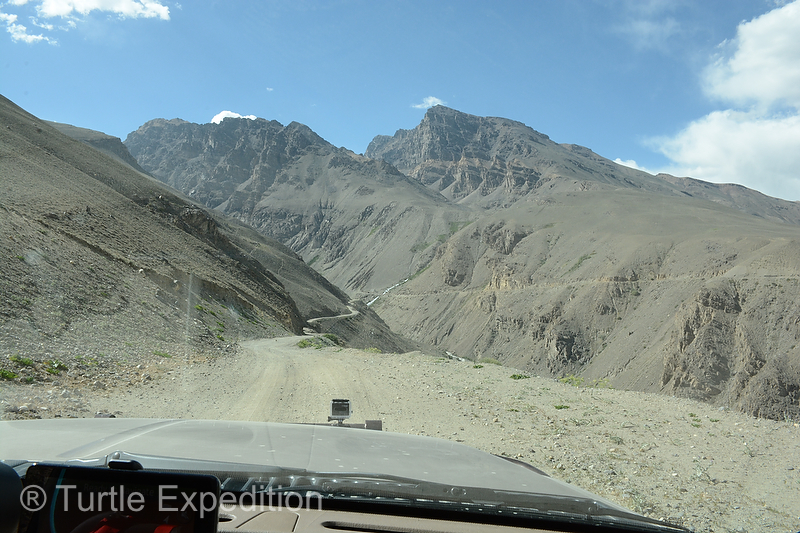 While we expected the mostly unpaved route through the Wakhan Corridor could be difficult, we were shocked at the roads we had to drive from the capital of Tajikistan, Dushanbe, to Khorog, the center of the Gorno-Badakhshan Autonomous Region, which required a special permit. 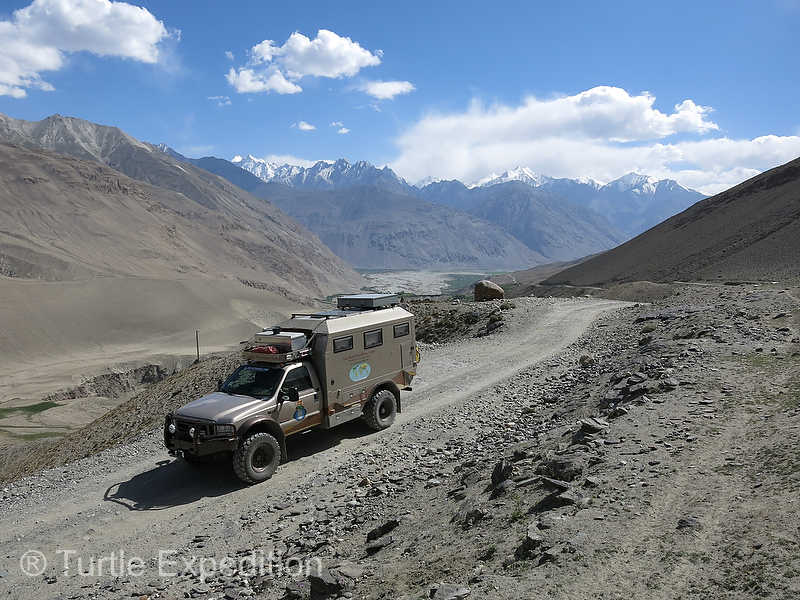 Once the pavement ended in the Panj Valley of the Wakhan Corridor outside Langar, the last village of the agricultural area, we switched to low range and 4×4 to negotiate the difficult sections more easily. 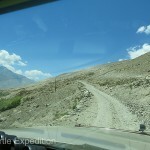 But in fact, to our surprise, much of the road was quite passable although very bumpy and extremely dusty. 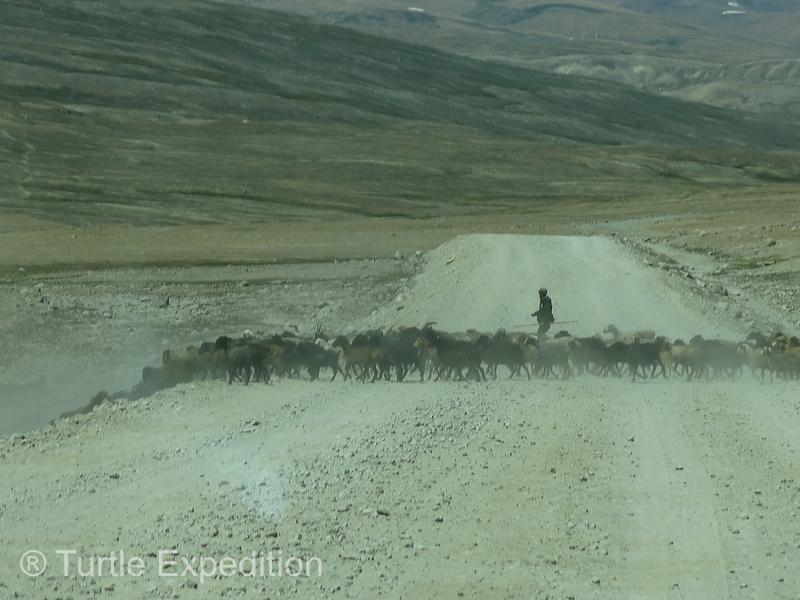 Traffic was light. 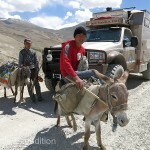 Small Chinese micro vans and burros seem to be the modes of transportation in the valley. 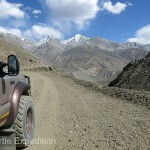 4×4 SUV’s in the higher, uninhabited altitudes worked better. 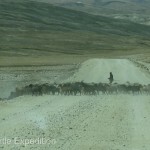 Herds of cattle, goats and sheep occasionally crossed in front of us. 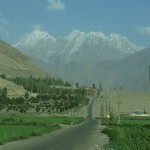 The attraction of this route along the Afghan border was always the beautiful mountains, some of the highest in the world. 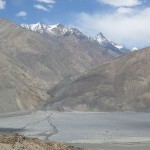 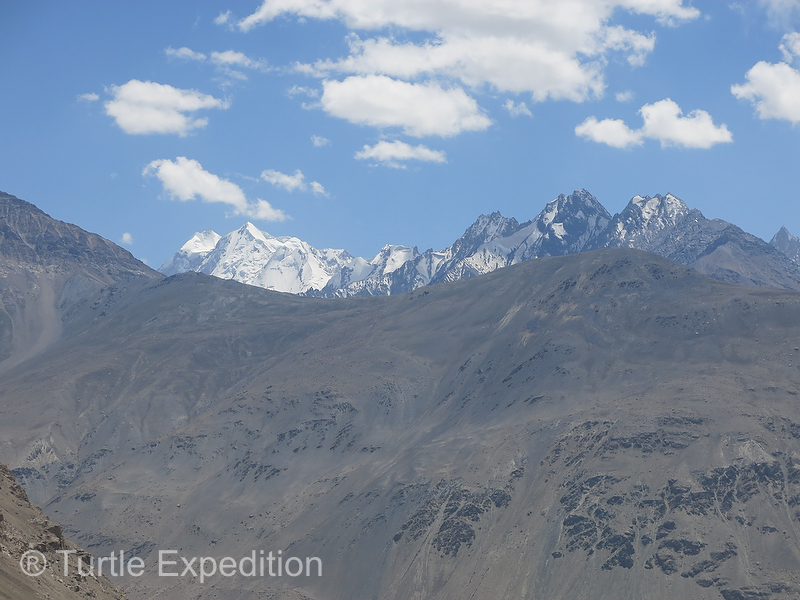 As we followed the Panj River and the later the Pamir, always along the Afghan border, the mountain range to our left has often been referred to as the “Roof of the World”. 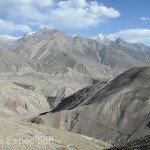 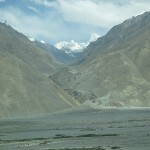 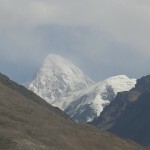 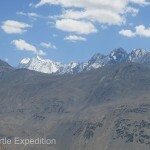 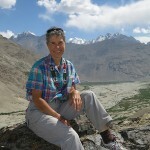 On the southern border of the Wakhan Corridor, the Hindu Kush Mountains could be seen in Pakistan. 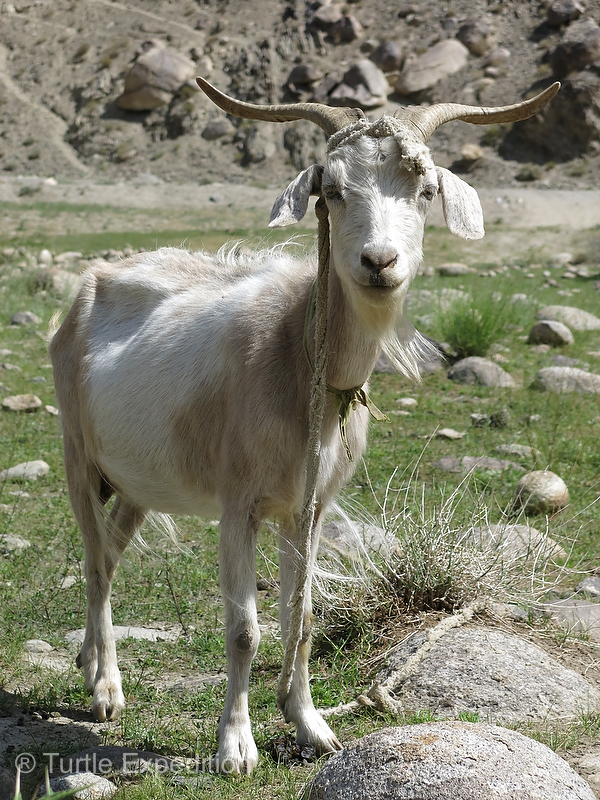 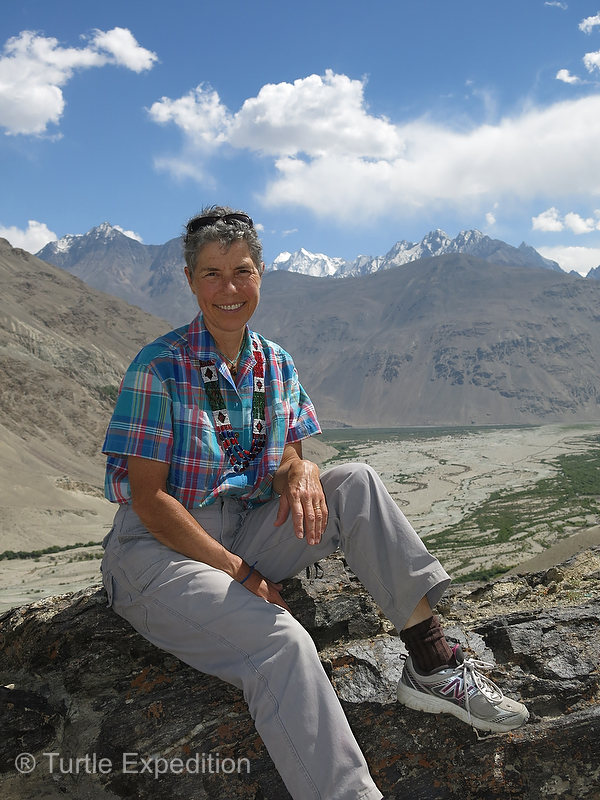 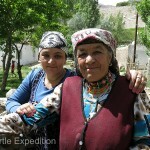 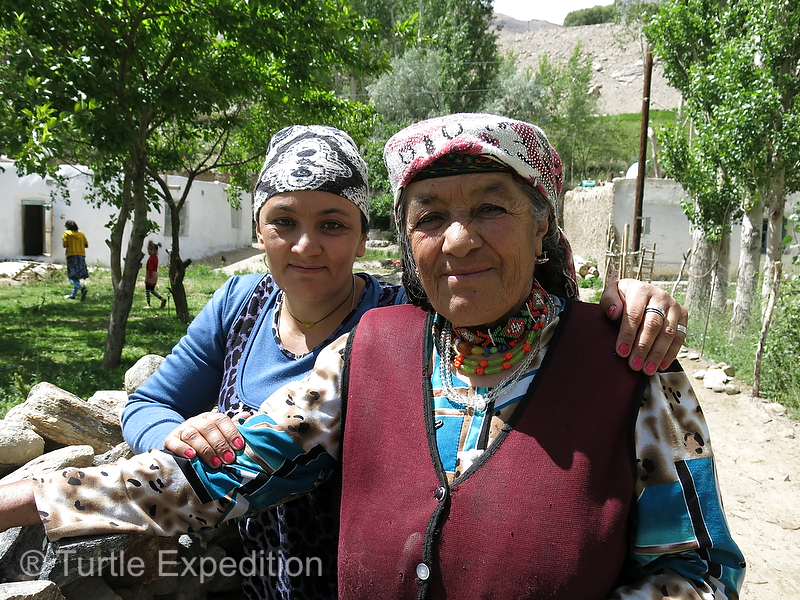 We had hoped to meet some of the natives who live in the Pamir Mountains, herding their goats and sheep. 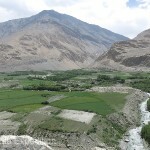 To our surprise, most of our interaction was in small villages in the valley where potatoes, wheat and other grains were grown. 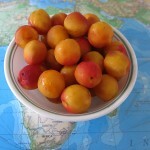 The area is particularly famous for their apricots of which there are some 160 varieties throughout Central Asia. 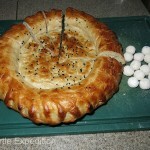 It was the perfect season for these delicacies. 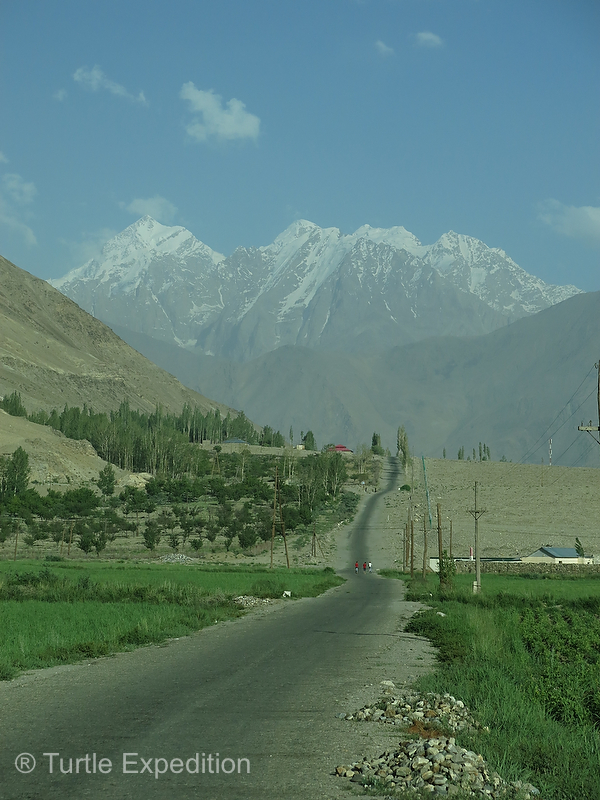 Children were selling buckets of apricots along the road and were waving at us to stop. 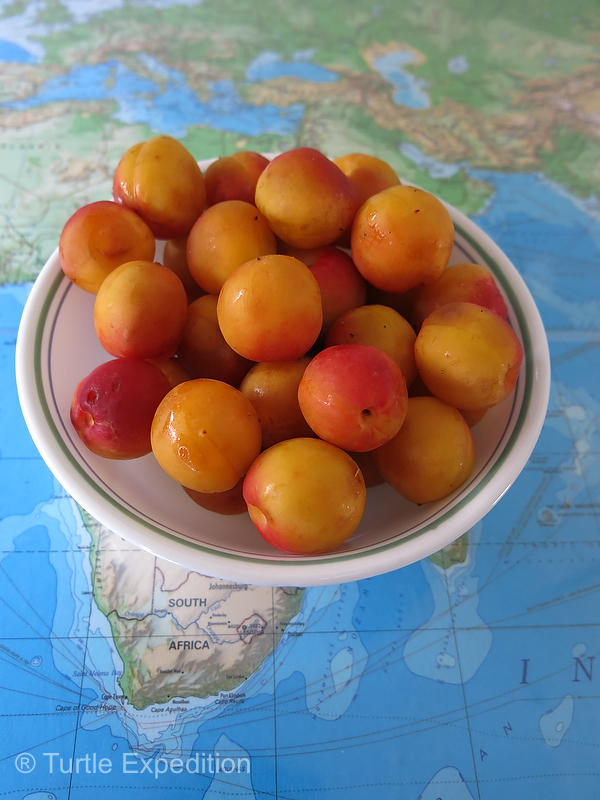 They were hard to resist at 10 or 20 cents a pound, picked ripe right off the tree. 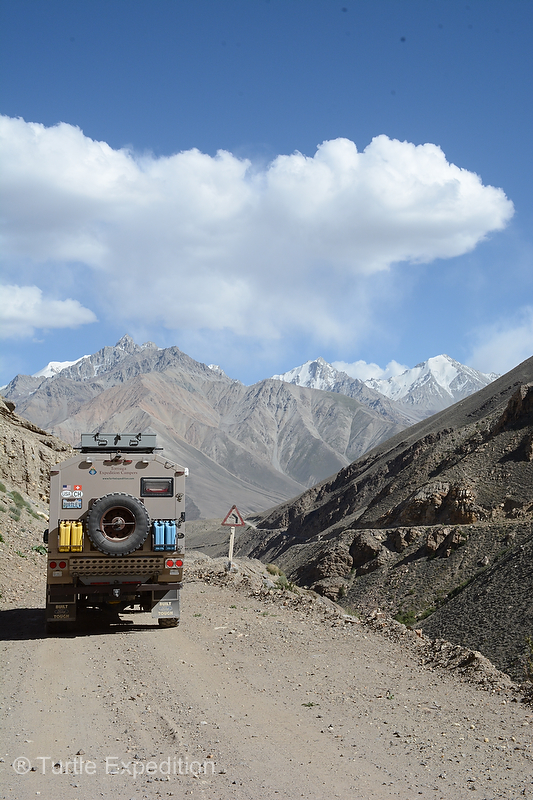 Children, men and women waved as we passed. 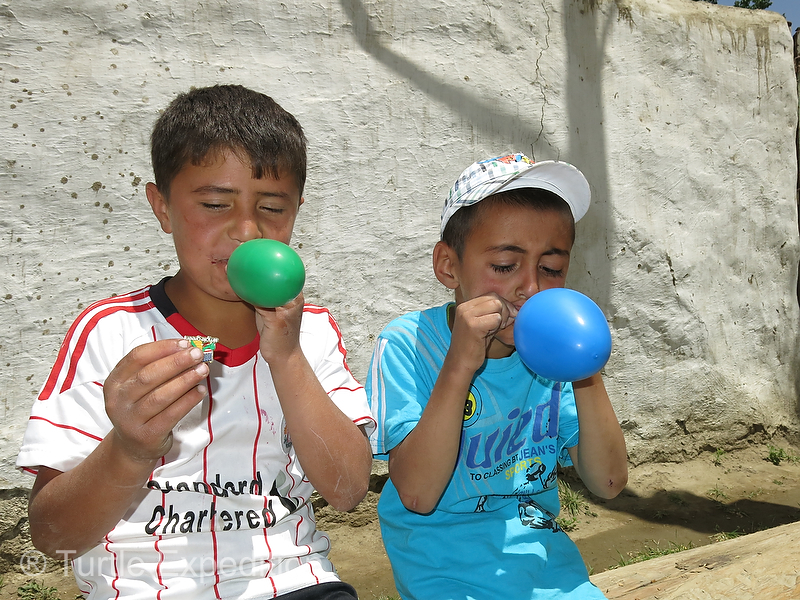 We sometimes stopped to give the children balloons or stickers from our sponsors. 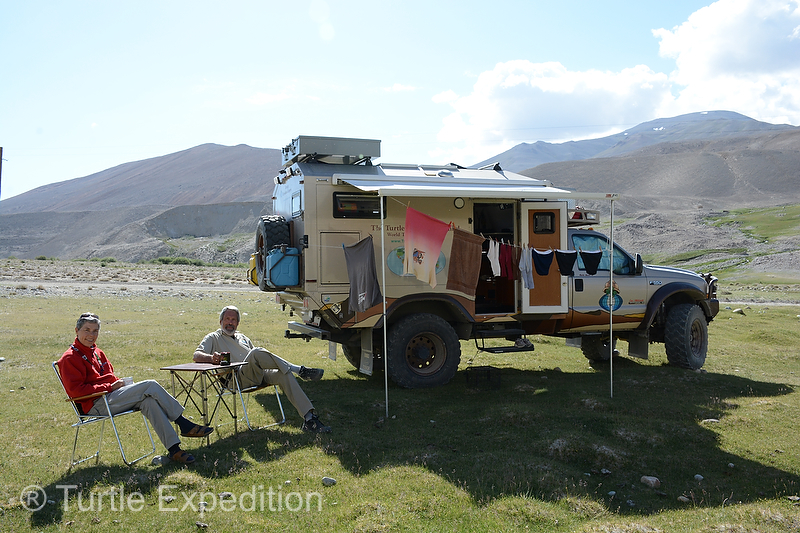 Our camps were often near a village and occasionally, people would invite us for chai (tea) which we usually declined, knowing that times are tough and they often serve more than tea. 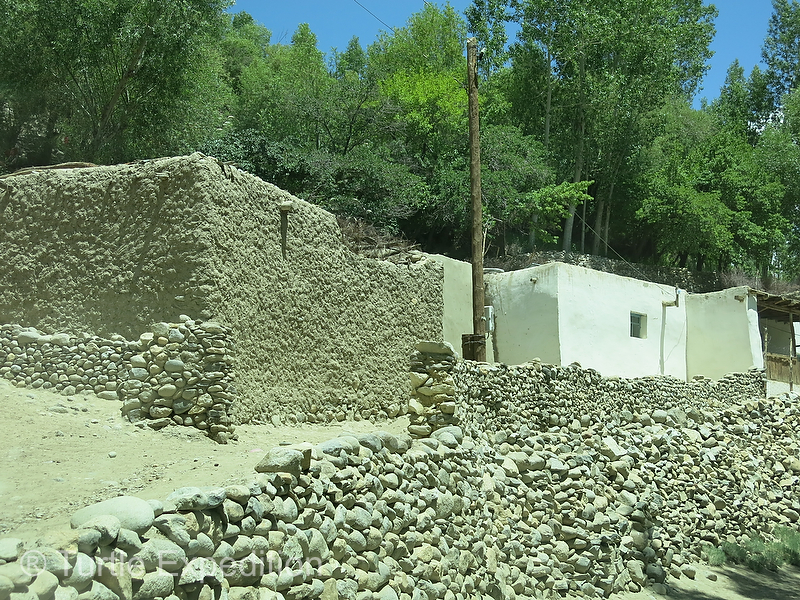 People were very busy working in their fields and gardens. 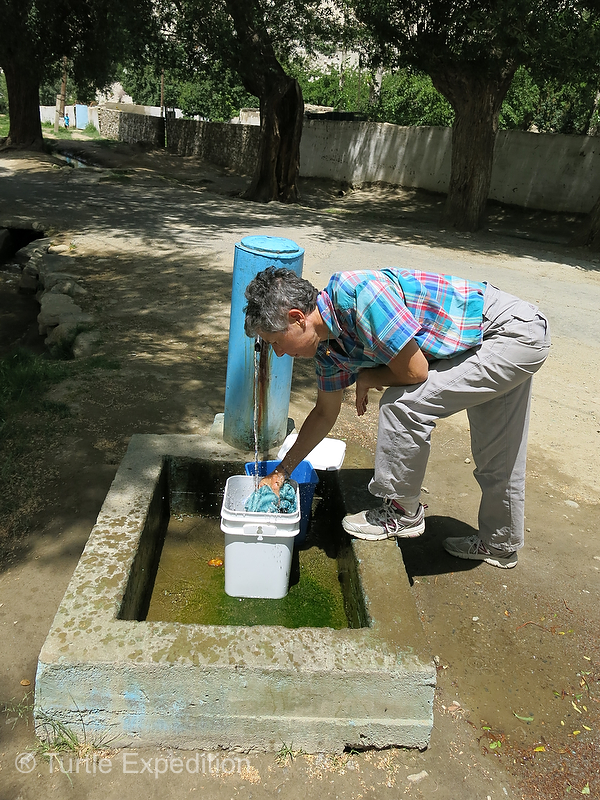 For us, it was also the reality that while everyone has a cell phone (or so it seems) and many have satellite dishes, none of them have running water and sanitation conditions are very third world. 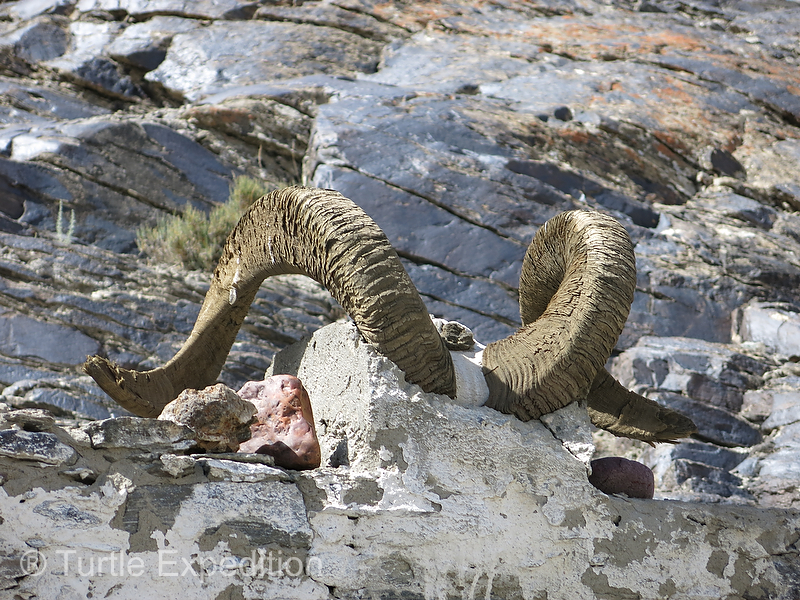 We had hope to see a few of the endangered Marco Polo Bighorn Sheep but all we saw were marmots in the higher altitudes scurrying around and the occasional shrine with Ibex and Marco Polo sheep horns. 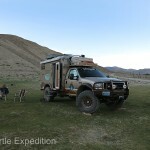 Some of our camps were above 13,000 ft. and we were able to enjoy hot water and even a nice shower thanks to the new high altitude compensation kit installed on our Espar D5 Hydronic coolant heater. 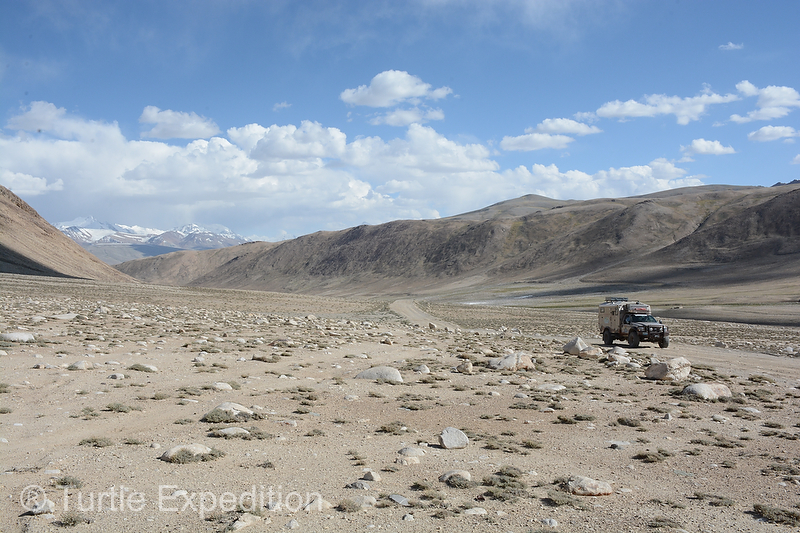 As we left the valley and climbed into the Southern Alichur Range towards Khorgach Pass, the scenery was shockingly beautiful with its lack of vegetation. 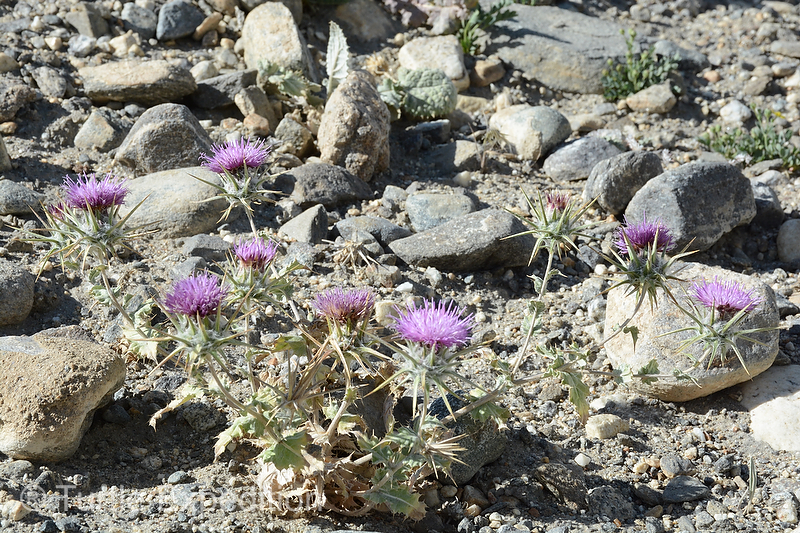 Even at this elevation, a few flowers grew. 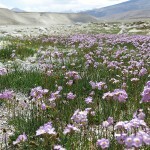 Where sparkling creeks cascaded down from snow clad peaks, grass and small shrubs were growing but the perfusion of wild flowers we had seen in other high altitude areas like the California Sierras or the Swiss Alps, were missing. 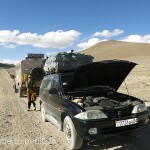 On one occasion we were able to assist a couple with a dead fuel pump. 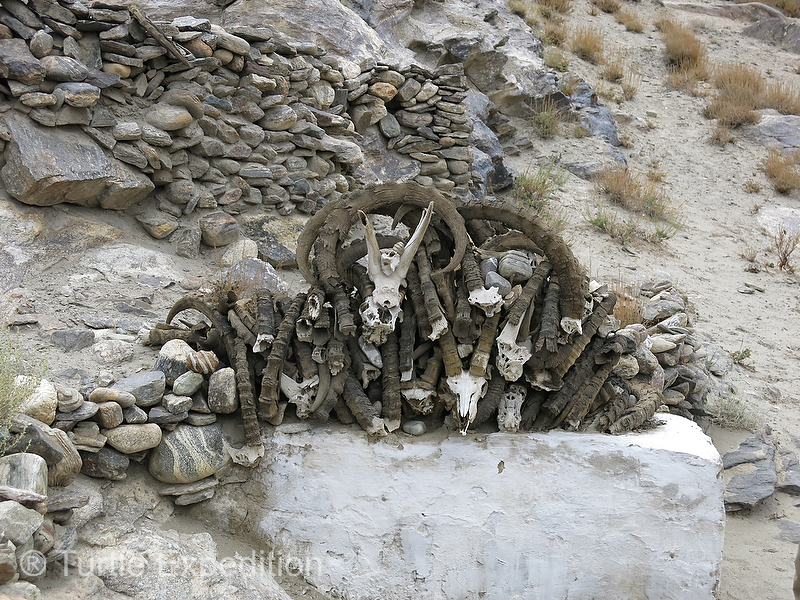 They had been sitting on the side of the road for two hours with no vehicle passing and temperatures were down to 5 °C / 41 °F and evening was approaching quickly. 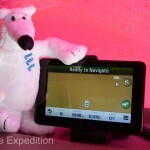 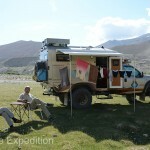 Gary had the wire and connectors needed to jury-rig their fuel pump and after an hour, they were gratefully on their way. 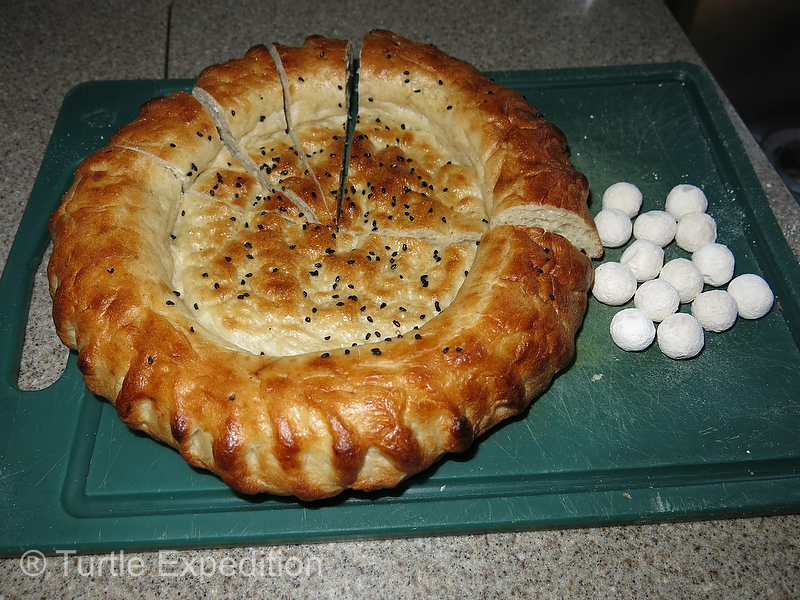 They presented us with a fresh loaf of Nan (flat bread) and some curiously tasting mothball size yoghurt/salt balls. 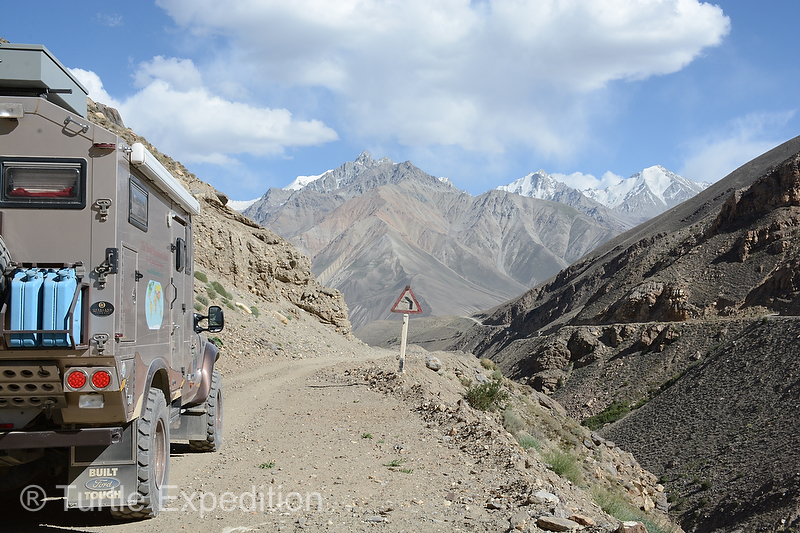 While there is much more to be said about this amazing section of the famous Silk Road, we hope the pictures below will give you an impression of our experience. 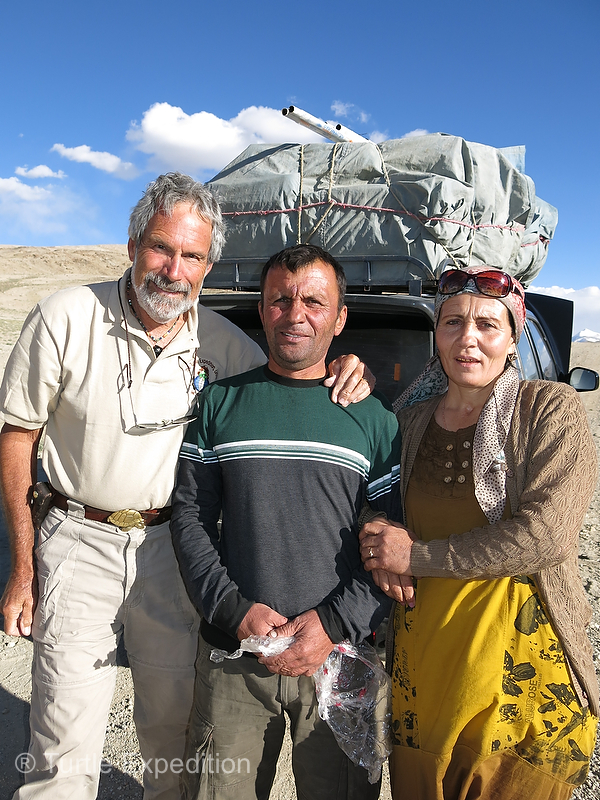 Despite the rumors of border conflicts, we encountered no problems of any kind and even the Afghanis across the river sometimes waved back to us. 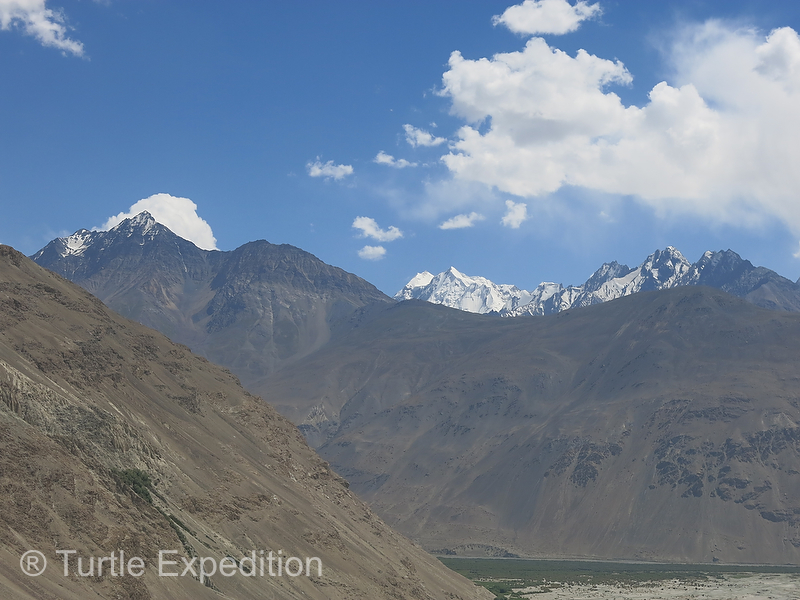 The beginning of our route from Khorog passes through a fertile valley along the Panj River, with snow clad peaks in the distance. 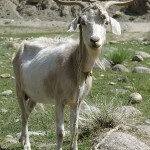 Occasionally herds of goats would cross in front us but this guy was left behind. 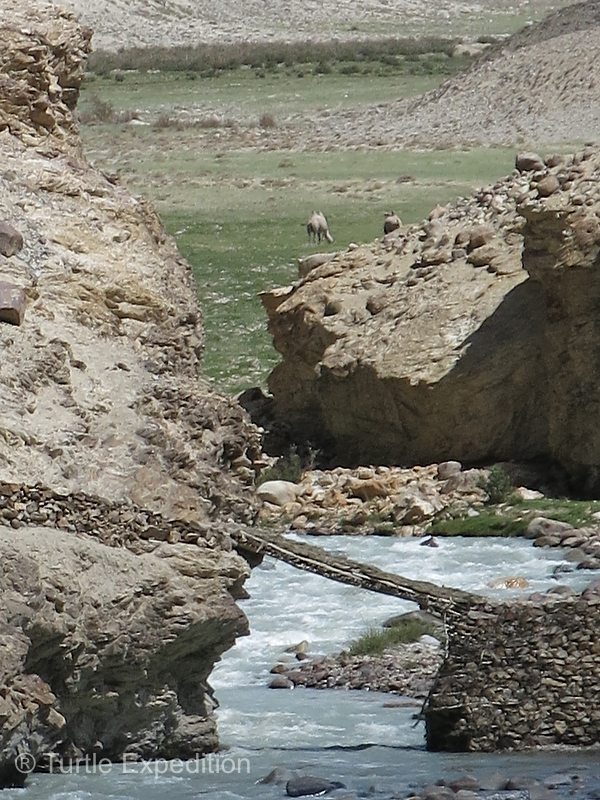 Precarious bridges spanned side creeks on the Afghan side. 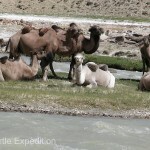 See the camels in the distance. 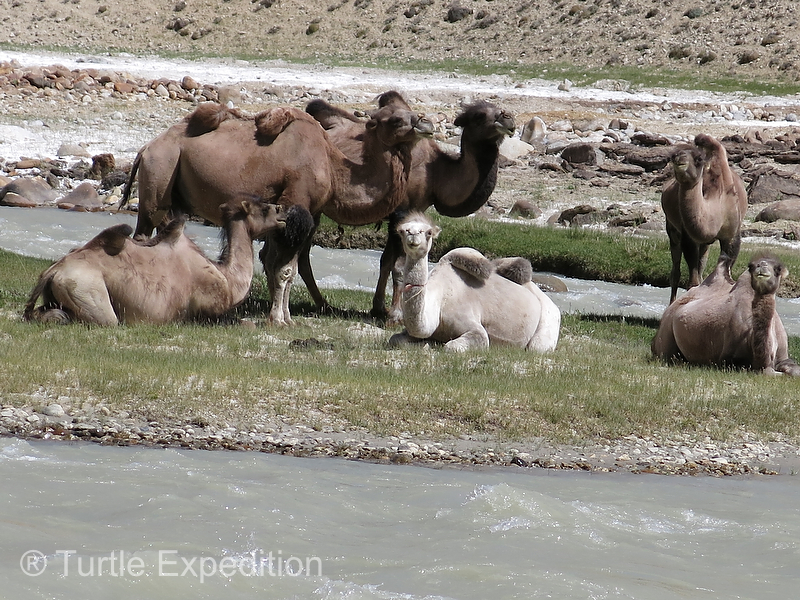 We spotted this small family of camels and wondered if they had retired from carrying silk and spices. 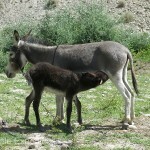 Burros were one of the main forms of transportation in this remote area. 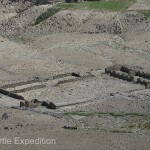 People also walked for many miles just to get to their fields or other villages. 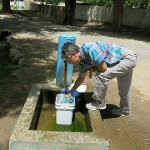 Monika takes advantage of one of the spring fed fountains in a village to finish up a mini wash. 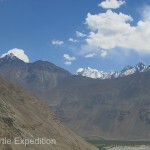 The jewels of the Wakhan Corridor were these beautiful bite-size apricots. 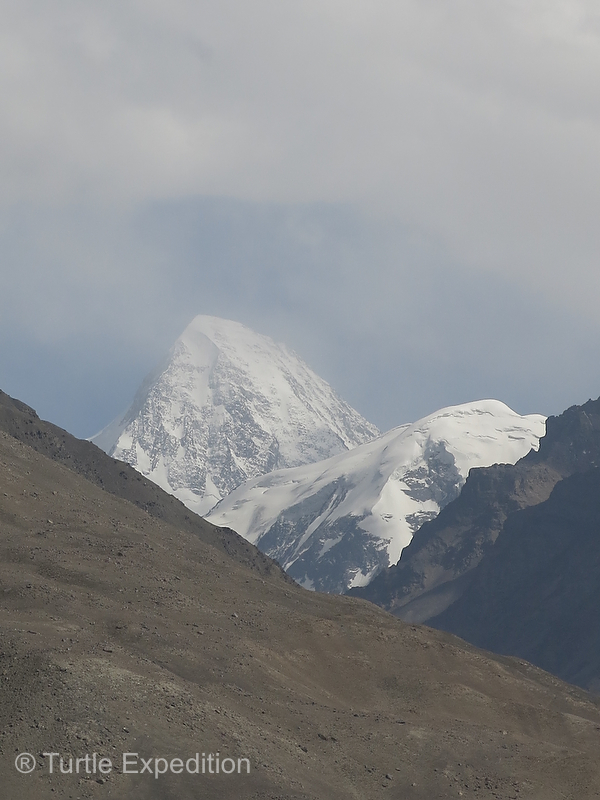 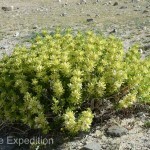 We were astounded that they are growing up to 2,300 m (7,545 ft.). 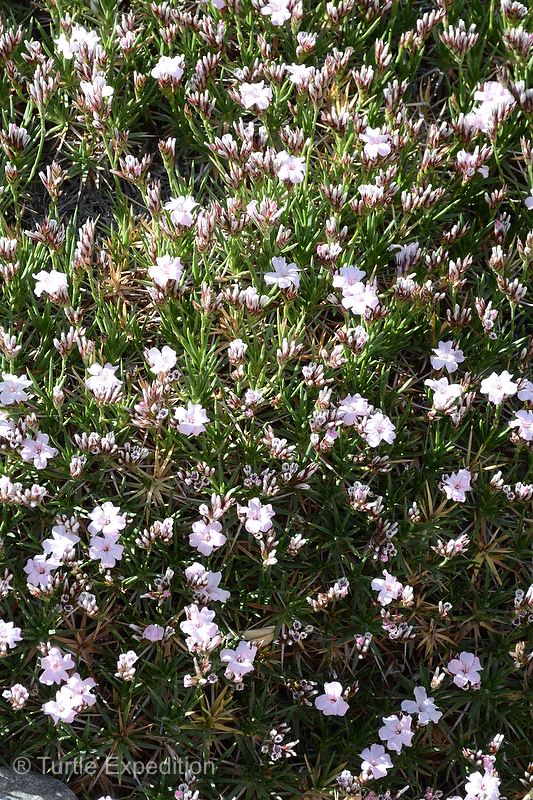 Yes, we are bringing some seeds back. 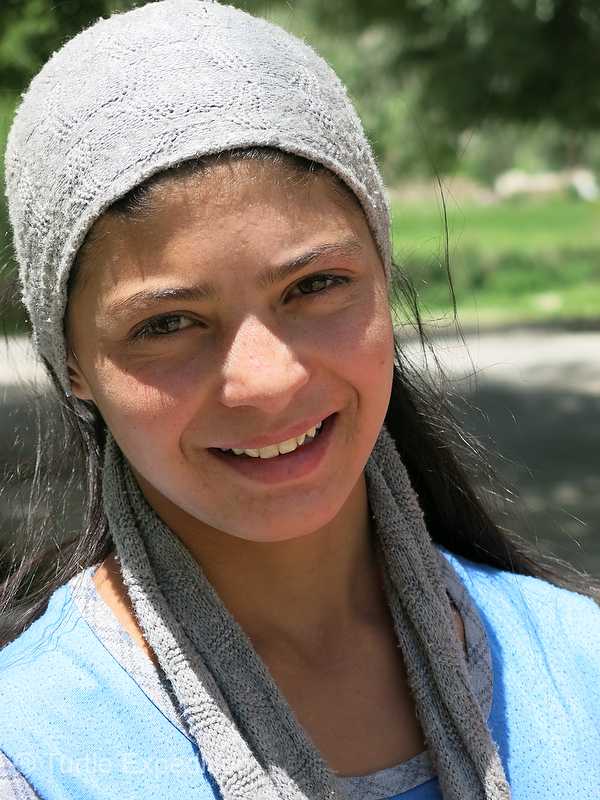 Many of the Pamir girls were beautiful, even without $5000 worth of orthodontist’s work. 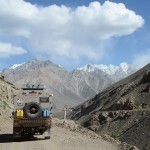 Balloons were always a great treat for the young children who waved to us. 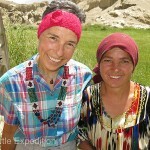 Monika bought a beautiful beaded necklace from this lady. 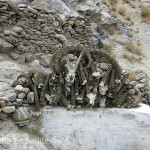 Apparently it was her own creation using local tribal designs. 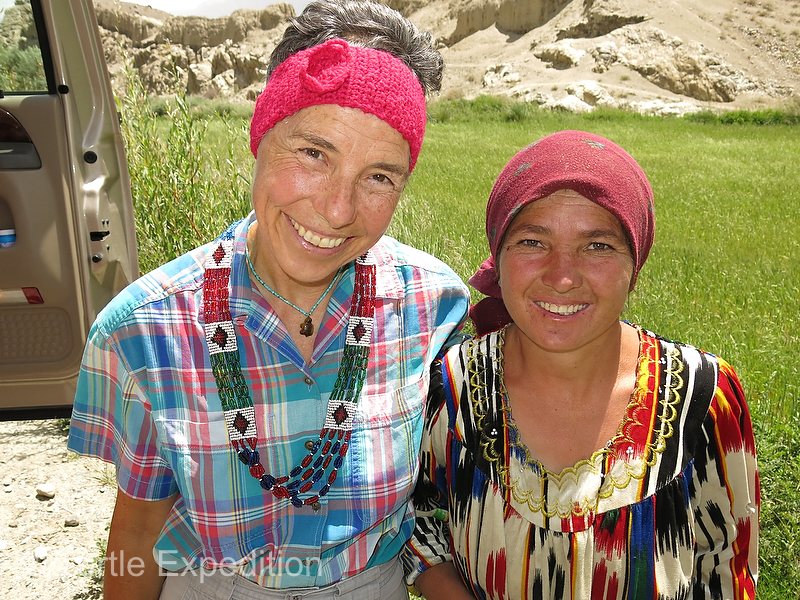 The ear warmer was a special gift from the artist after Monika presented her a little bag of useful items like safety pins, tooth brushes, etc. 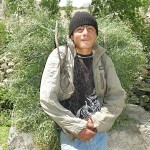 Young men returned from the fields carrying bundles of hay cut laboriously with a small hand sickle. 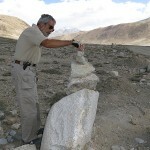 Apparently they prefer this tool in a land where machinery is absent. 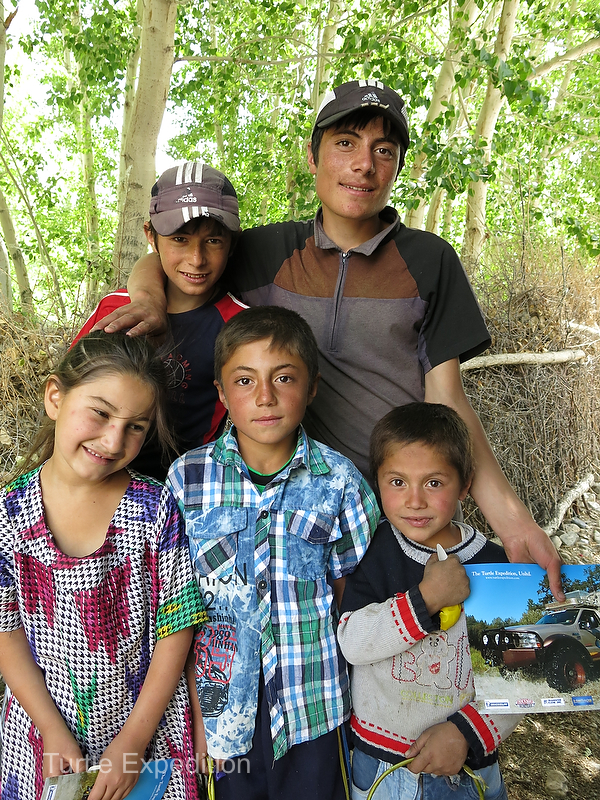 Everyone loved to have their picture taken and sometimes we made prints for them with our little photo printer. 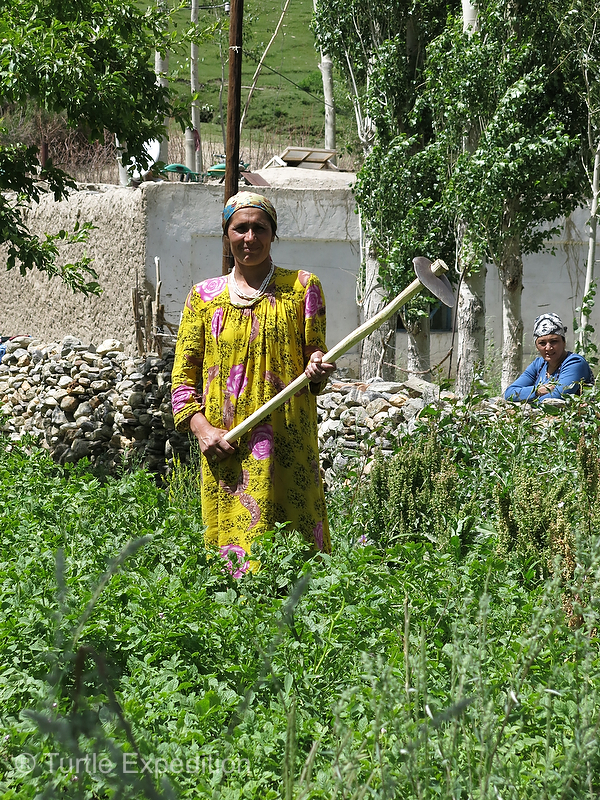 We saw many women working in gardens and fields with hoes, weeding the potato and vegetable patches. 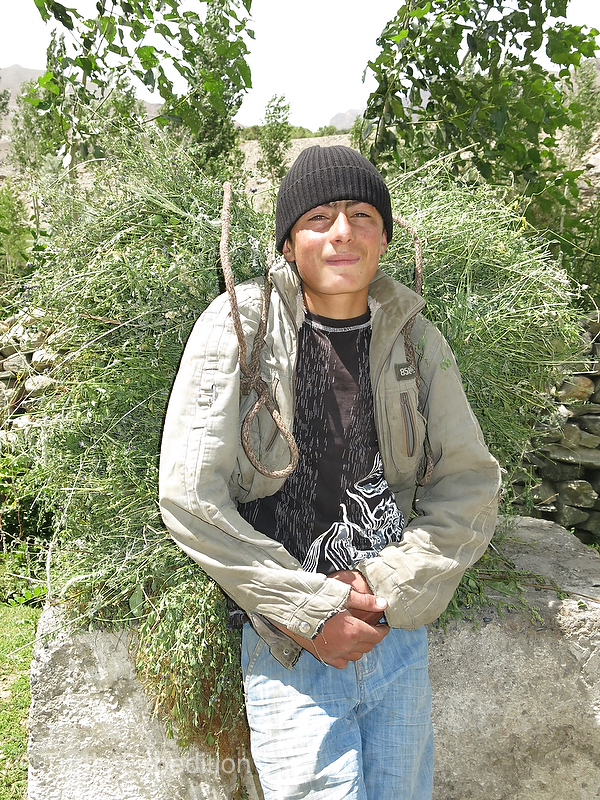 Intensive manual labor is part of life. 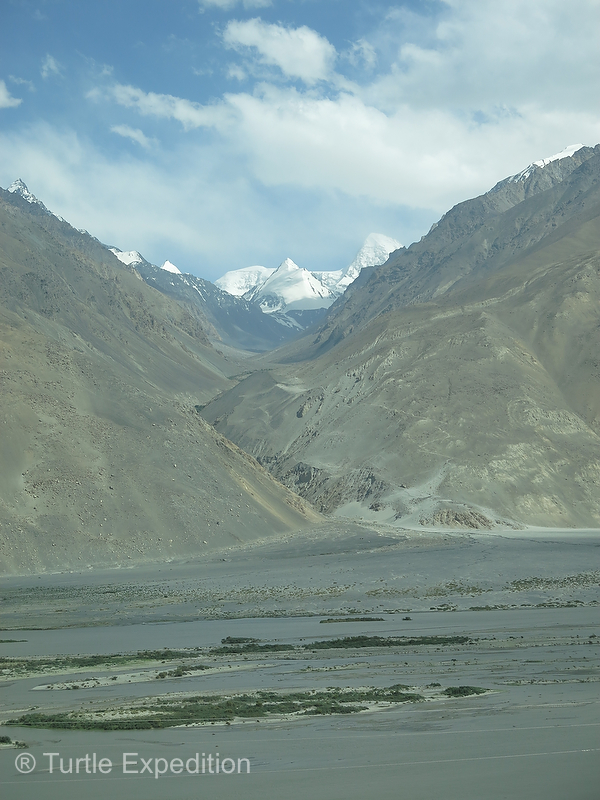 Around every corner there seemed to be a new view of snow capped peaks, many over 5,000 m (16,400 ft.) high. 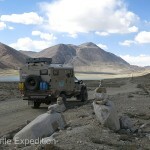 We expected the roads to be much worse but our average speed was still 10-15 mph at best. 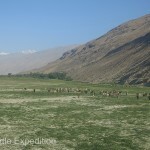 Herds of sheep and goats and cattle sometimes crossed in front of us. 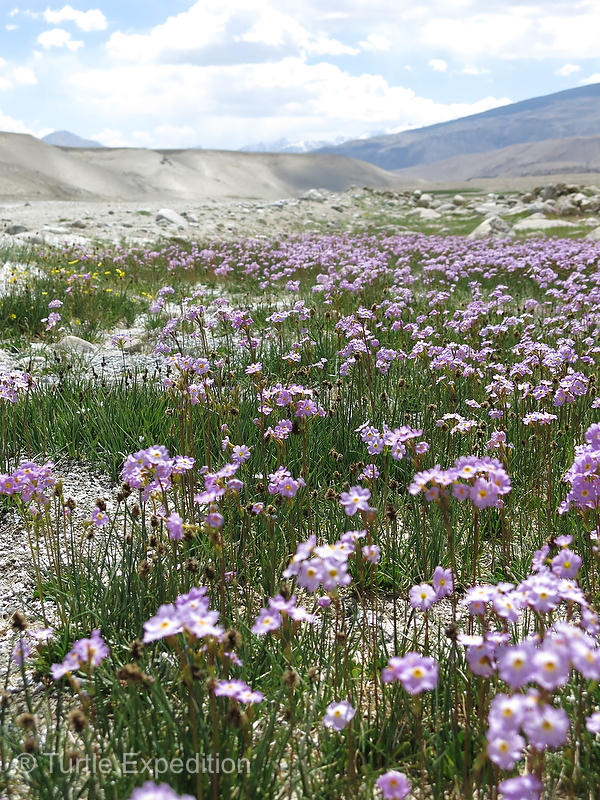 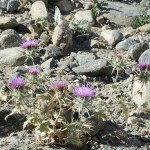 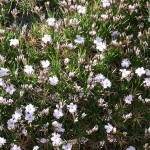 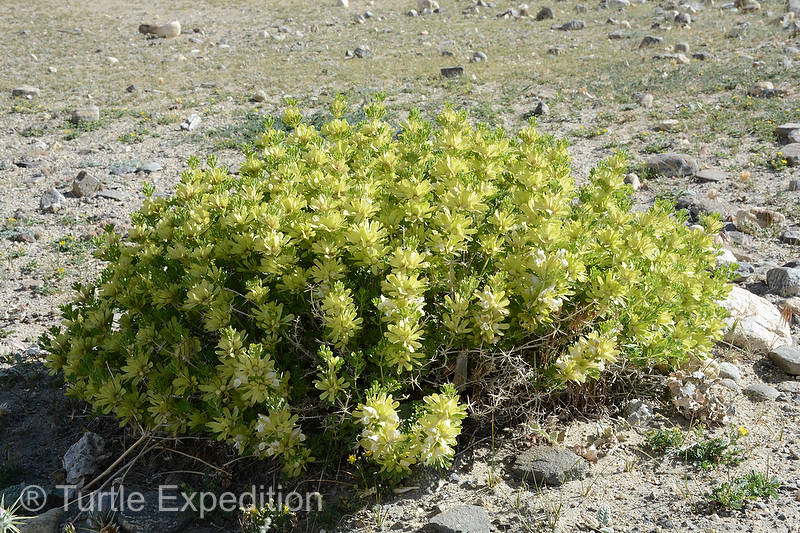 Even at these extreme altitudes we found patches of flowers growing. 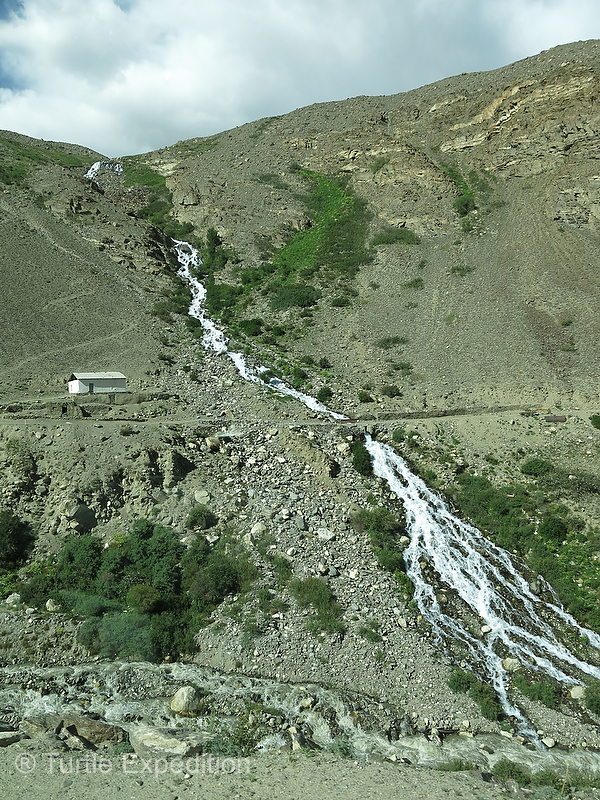 Clear streams were cascading down from alpine snow packs. 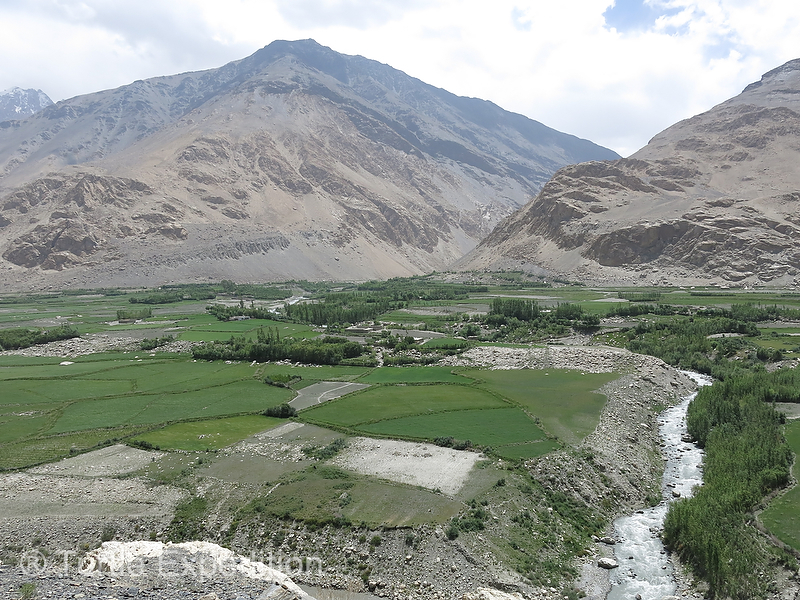 Pockets of green dotted the valleys between alluvial plains spilling down from barren ridges. 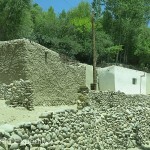 Typical Pamir houses were made with rock or handmade bricks and covered with a layer of mud. 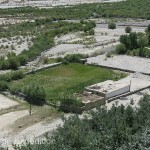 Subsistence gardens were sometimes adjacent to their homes. 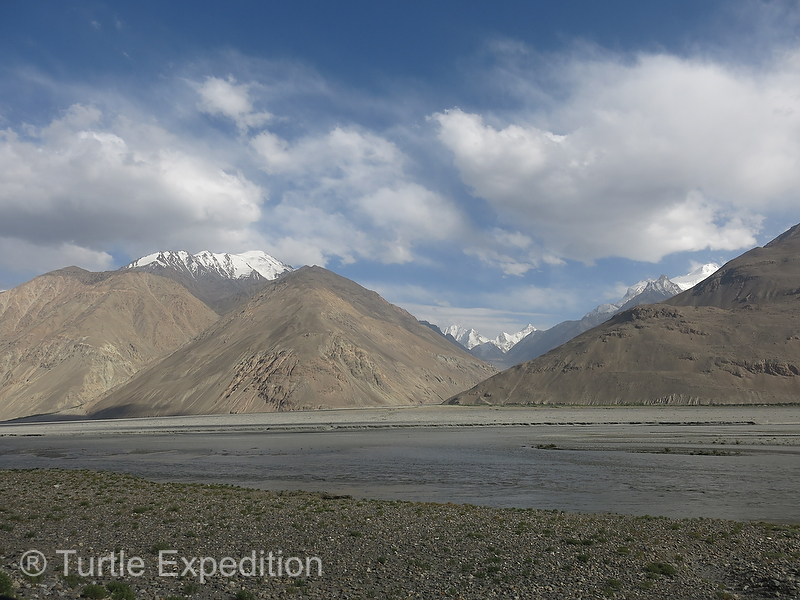 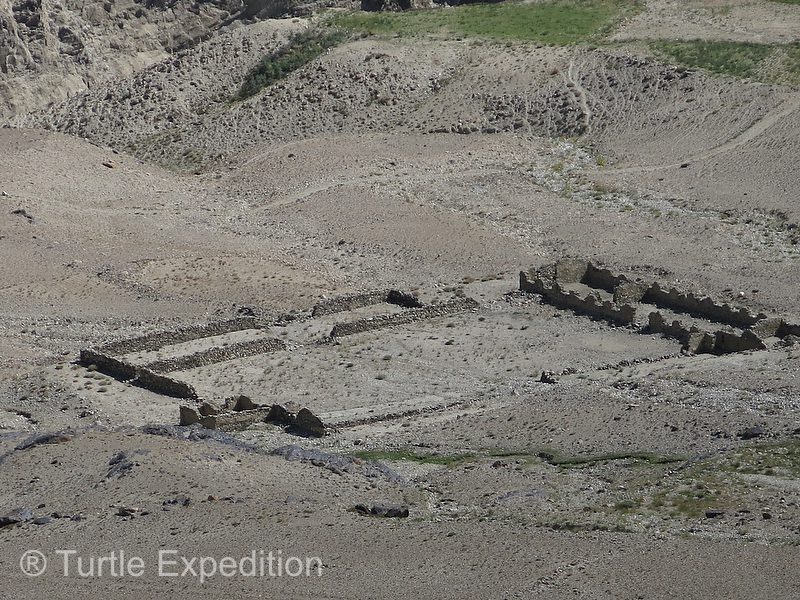 We did spot the ruins of this old Caravanserai where trains of Silk Road traders would stop to trade and rest for the night, safely away from the bands of roving bandits and wild animals. 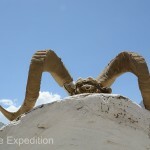 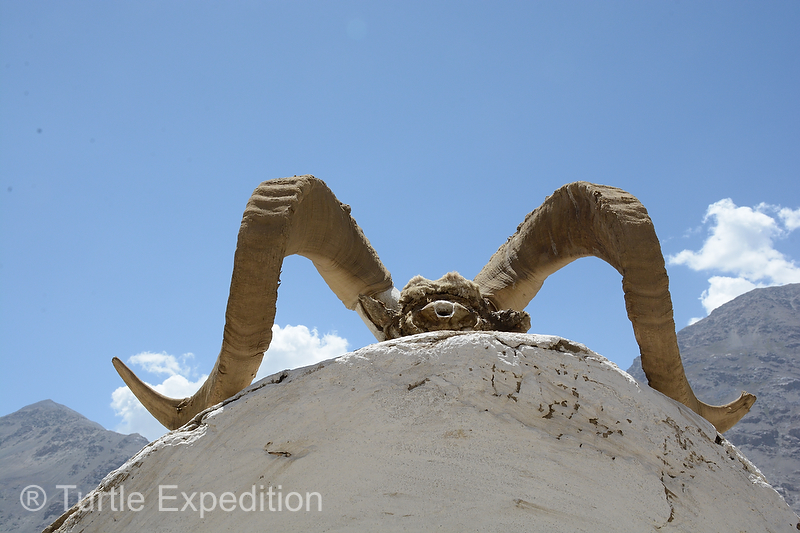 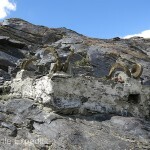 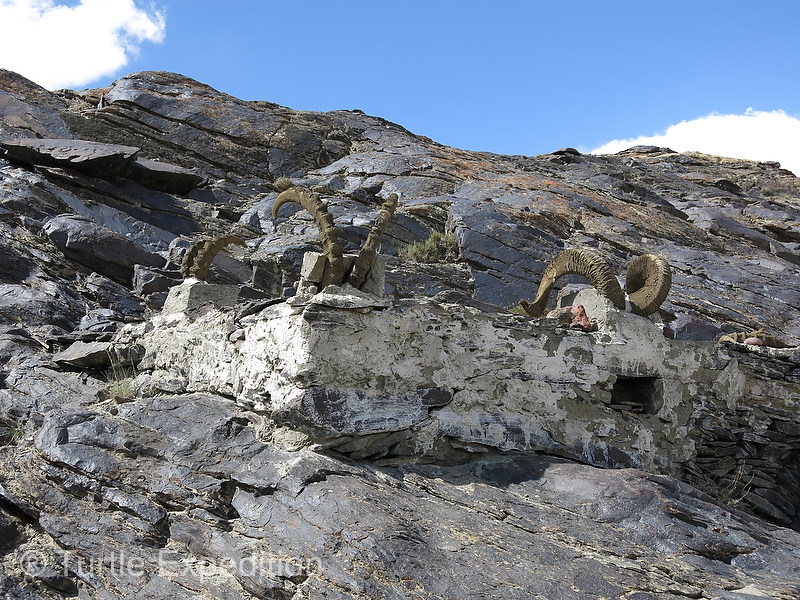 We had hoped to spot a couple of the endangered Marco Polo Bighorn Sheep or even an Ibex or two but all we found were stacks of horns in roadside shrines. 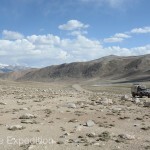 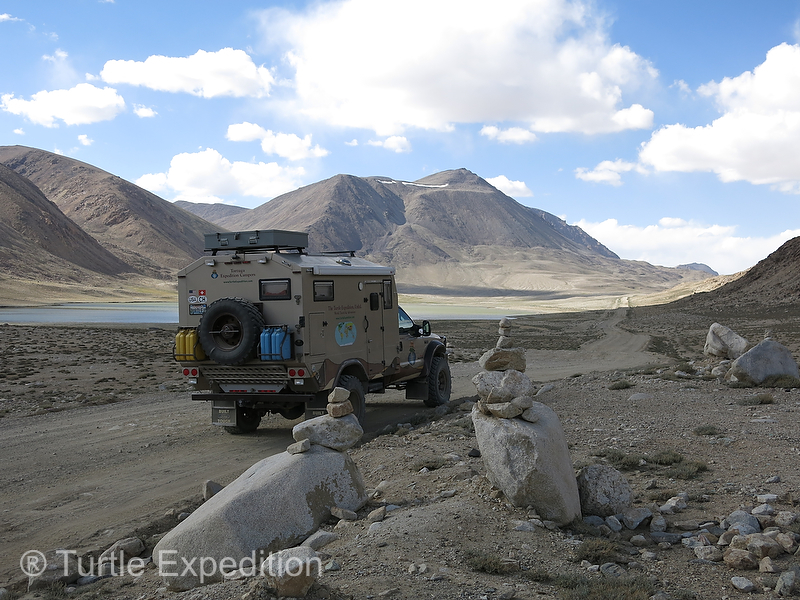 Reaching Khargush Pass, the highest point on the Corridor, there were cairns. 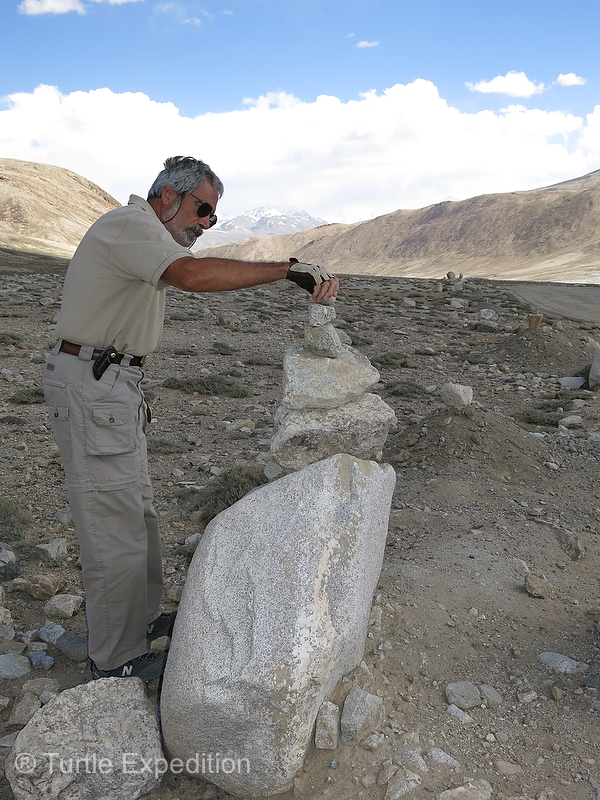 Gary placed a rock on one just for good luck to ensure safe travels. 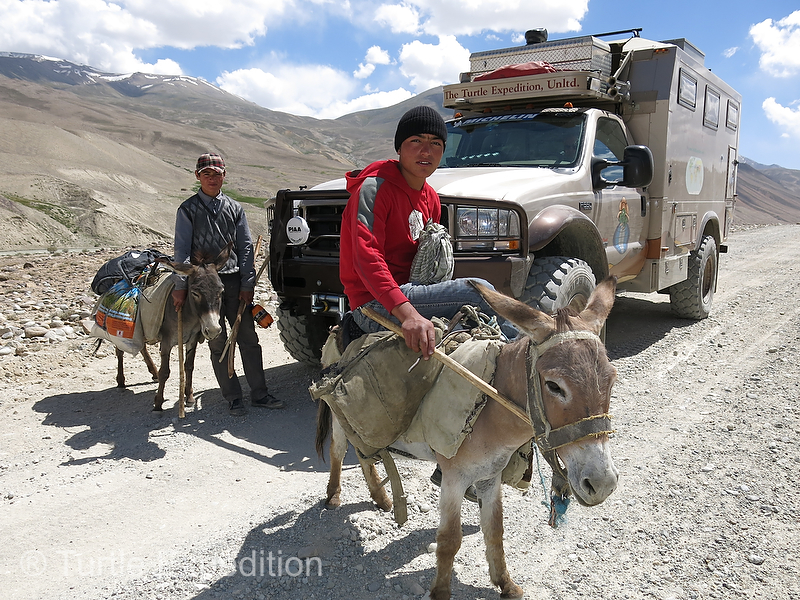 We stopped to help this fellow traveler out with his malfunctioning fuel pump and they were very grateful to be on their way. 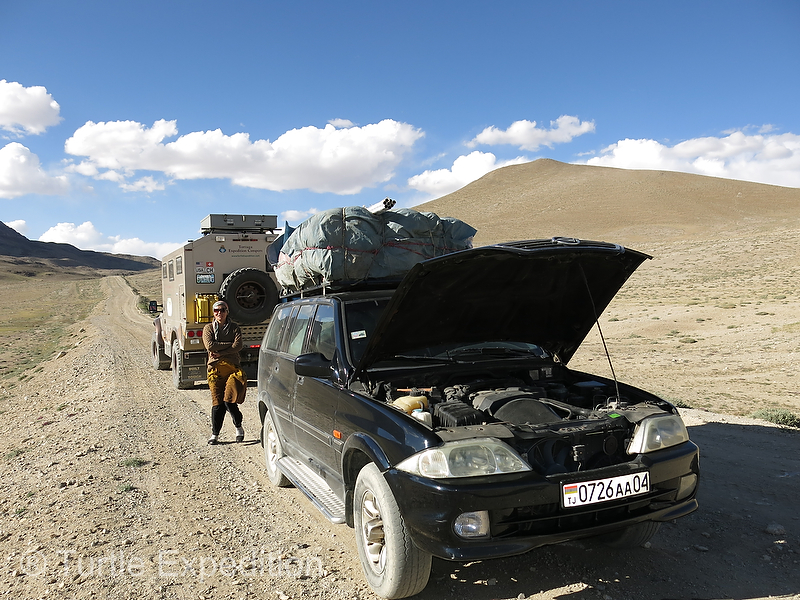 After Gary helped repair the fuel pump on the stranded Mercedes while Monika made some hot chai for the cold couple, they gave us a beautiful Nan (local bread) and some salty yoghurt balls, a staple for travelers in this region. 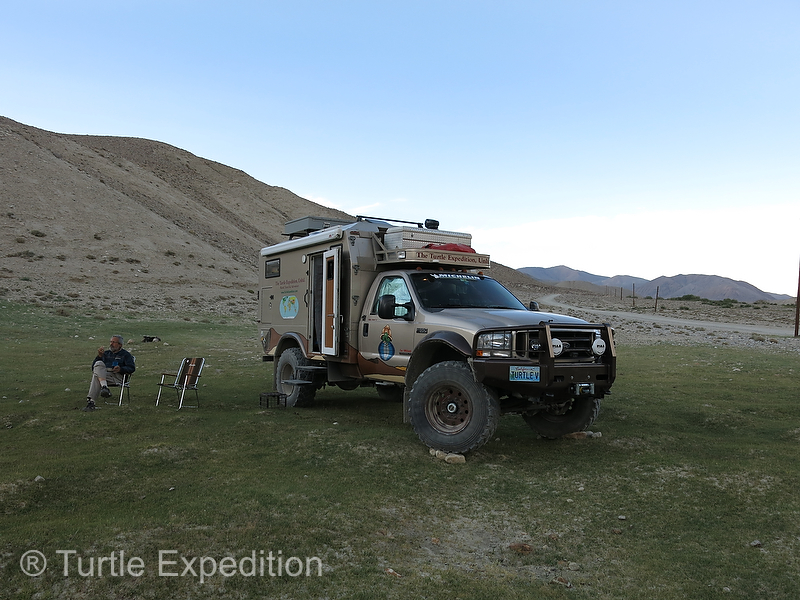 Finding a flat spot on the side of the road, we were sometimes able to enjoy fresh coffee with a morning sunrise. 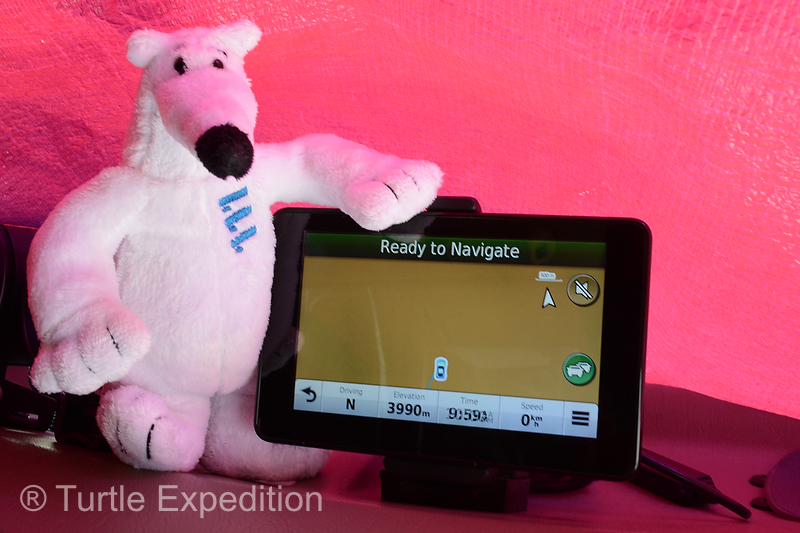 Our camp at 3,990 m (13,090 ft.) gave us a chance to check the recently installed high altitude compensation computers on our two Espar heaters. 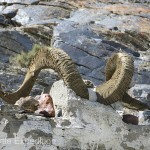 Both of them fired up without a problem and we enjoyed a hot shower one morning. 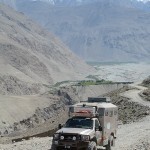 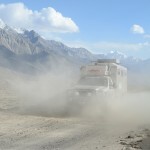 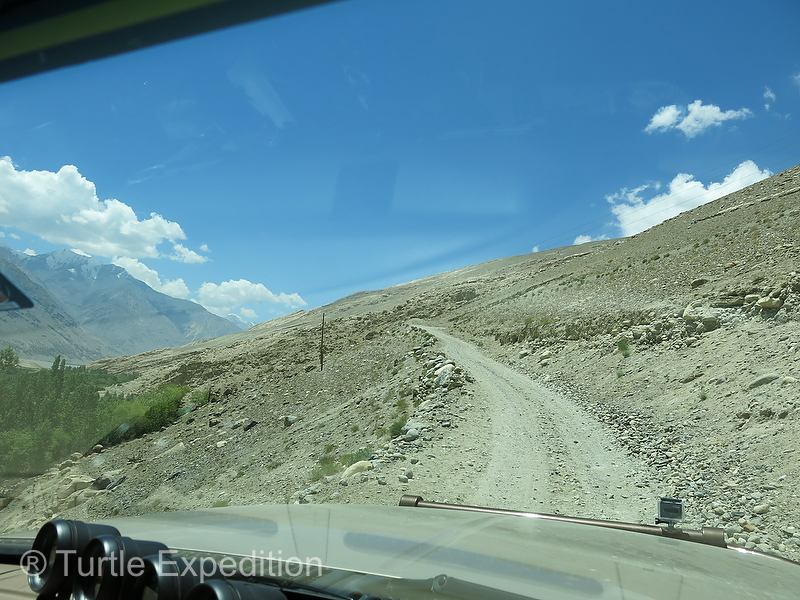 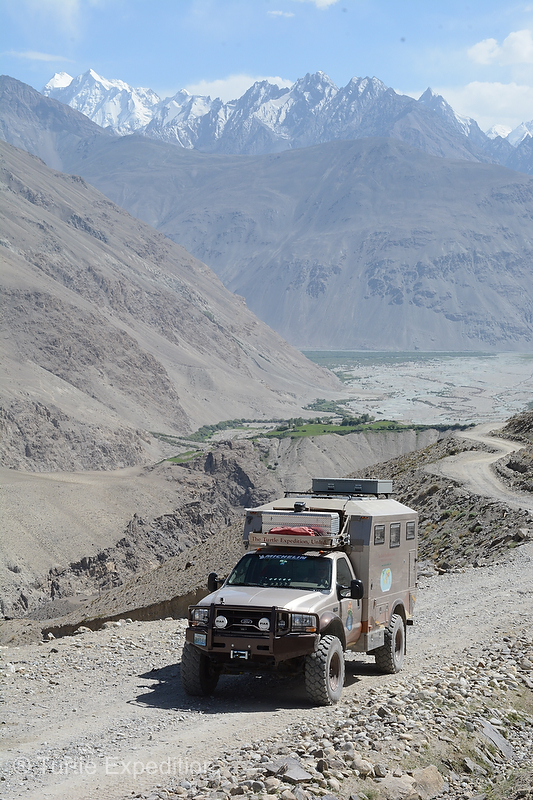 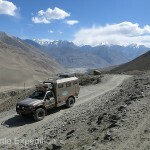 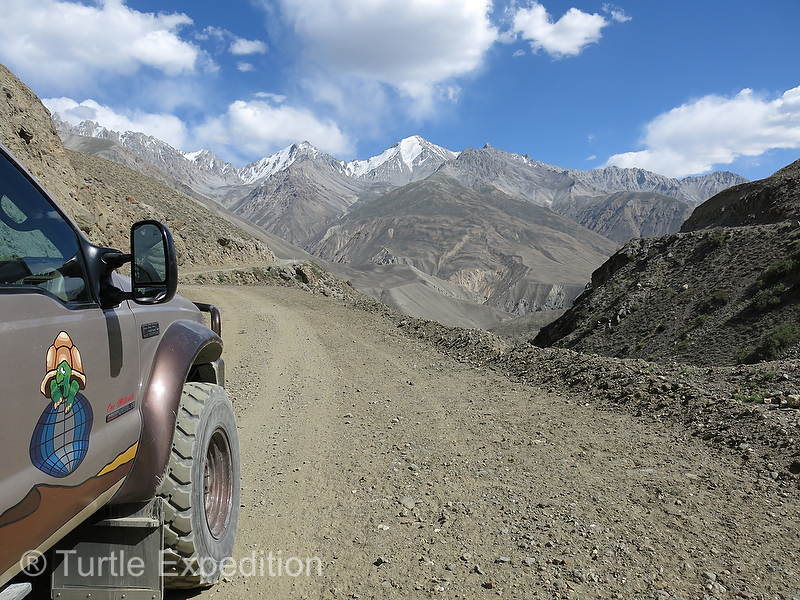 Well yes, we have driven the infamous Wakhan Corridor. 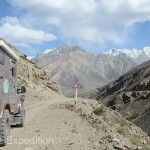 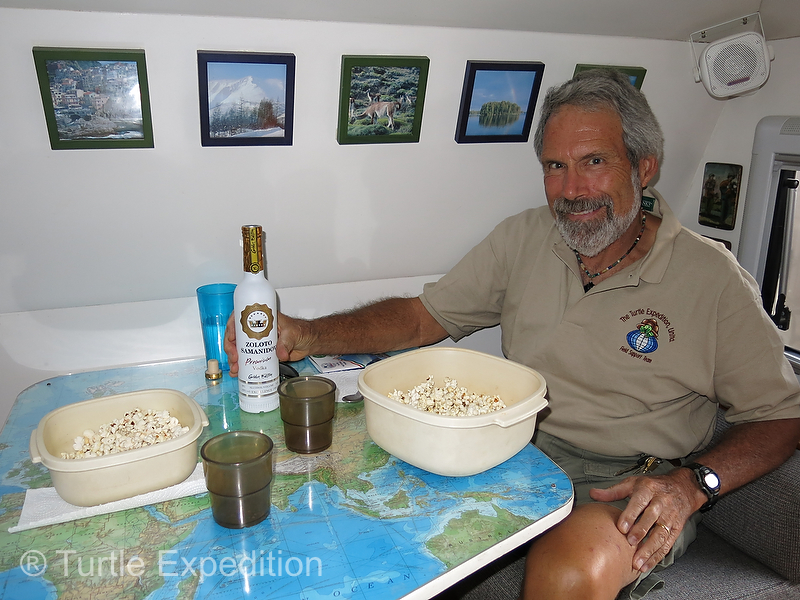 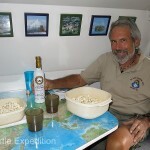 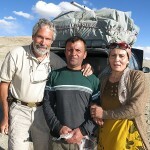 It was a point on our journey along the Silk Road worth of a toast of Tajik vodka and popcorn. 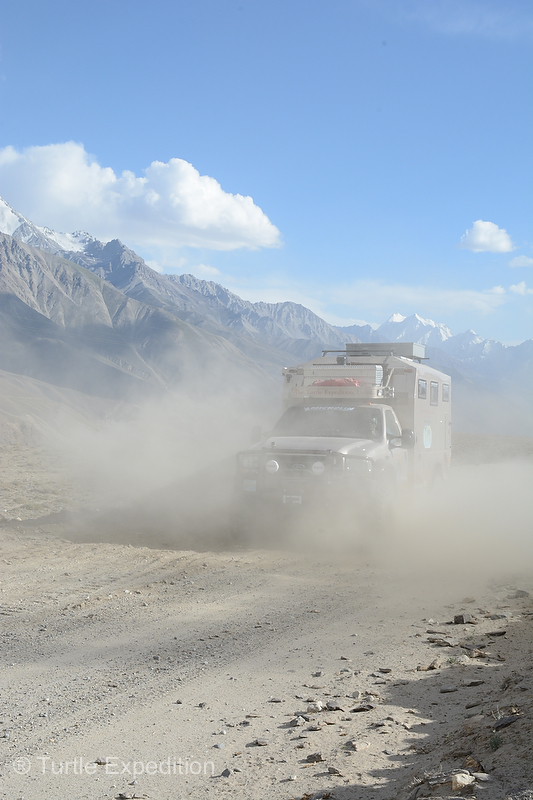 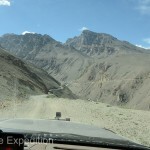 Now, we will return to Khorog on the equally beautiful Pamir Highway where we will top off our supplies, check Internet and make a U-turn to head towards the border of Kyrgyzstan.